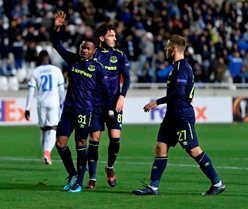 What Does The Future Hold for Ademola Lookman At Everton? England's U-20 World Cup-winning winger Ademola Lookman has been struggling to find a permanent spot in Marcos Silva's team since the former Watford man joined the Toffees this season. Lookman has made 19 appearances competitions this campaign, and things don't look like it's going to get better before the end of the season. The Nigeria-eligible star definitely has the potential to become one of the deadliest youngsters in any league in the world — just as we saw during his loan spell with Bundesliga side RB Leipzig last season — but Silva has shown little or no trust in him. Lookman's current form has drastically dropped, no thanks to lack of regular action on the field of play. Silva prefers deploying 30-year-old Theo Walcott at the right flank, and Richarlison at the other side of attack, which is presently telling on the youngster's performances. The future doesn't look bright for Lookman and he might need to find his way out of the Goodison Park before the start of next season. A return to Leipzig in the summer transfer market won't be a bad idea, considering how deadly and wonderful he was during his first spell with the team. The 21-year-old must submit a transfer request to Everton, should he feel Silva is willing to block his switch to the Bundesliga side just as he did last summer.